It's been close to three years since Apple last updated the iPod Touch, and I don't think the new devices were worth the wait. Apple quietly updated its website today with a new lineup of the nano, shuffle, and touch. The new devices come in new colors and have a few upgrades under the hood, but they're no bigger than they were before (I was hoping for one with a 4.7" screen). The sixth-generation iPod Touch still has the same 4" screen (1136 x 640 resolution) as it had yesterday but under the hood you'll find an 8MP iSight camera and a 64-bit A8 CPU with a motion-tracking M8 coprocessor chip. Apple has also boosted the storage, adding a 128GB model to the lineup. The iPod Touch now comes with 16GB, 32GB, 64GB, or 128GB of storage for $199, $249, $299, and $399. The Touch, Nano, and Shuffle are all available today in six colors, including deep blue, silver, space gray, gold, red, and bright pink. This isn't the larger iPod Touch I wanted, but it's a significant upgrade nonetheless, so much so that it's going to be worth it to be cheap and get the previous generation when it goes on clearance. 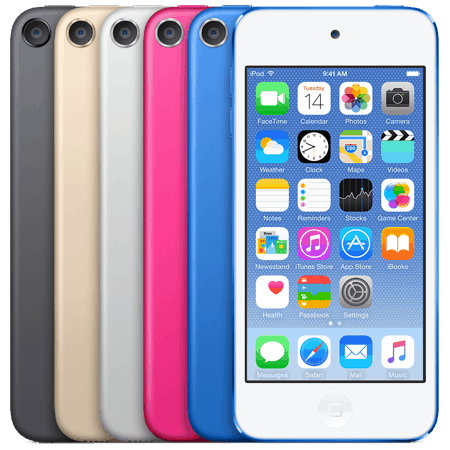 The CPU upgrade alone makes the older model a questionable value; while you could usually stay a generation behind on Apple hardware and still reap much of the value, the new iPod Touch is so much better than before that this is no longer true. Can you install the Kindle app on this thing, and what’s it like to read on it? Sure, the Kindle app works on all current Apple devices. The 4-inch screen is a tad small for my tastes though. When the Touch 5th generation is 3 years old, it is hard to recommend it. The new iPod has iOS 8 so I’m sure it will be upgradeable to 9 when it arrives. I agree with your thought about the screen size. A larger screen size would greatly increase the appeal. Even with a faster processor, I can’t see a reason to upgrade from my 5th gen. I think Apple already said the older model would be upgraded as well. Apple is good about upgrading old devices. However, I believe the 2012 Touch 5G will have iOS 9 as its last major version. It doesn’t look like the nano or the shuffle got a boost in storage, just new colors. I’m actually kinda glad, cuz I just got a nano and I’d be a little bummed if they released one with double the storage 2 weeks later. This ipod touch is all good but it would of been awesome if it came out in 5.5 inch version,I dont like the ipad mini,it’s too big,gonna wait till fall about getting this one in case the mystery release might be the ipod touch plus thats the perfect size for me. From what one Target manager wrote, I think we are in the minority. iPod Touches are mainly bought for kids (everyone else has a smartphone) so there’s no huge demand for a larger screen size.